During normal energy use, the power supplied by your meter (9.2 kVA on average) should suffice. In theory, this allows you to simultaneously supply devices with a maximum power of 9.2 kW or 9200 watts. As you never use all your electrical appliances at once, your basic installation should, in practice, more than suffice. If you have special installations that consume a lot of energy, such as a sauna, pottery kiln or electric car, then that power might not be sufficient. How do I calculate the maximum power that my electrical installation can supply? To calculate the maximum power that your meter can supply (expressed in volt-amperes), multiply the voltage (U) by the intensity (I) of the current that supplies your home. (*) For quick calculations or for the sake of convenience, √3 is often replaced with the approximate value of 1.73. We have used the same number here as well. Fun fact: the difference between both outcomes is a factor...1.73! And this is explained by the fact that a 400 V voltage also happens to be 1.73 greater than 230 V.
How do I know if my meter’s electrical power supply is sufficient? If you require more electrical power than your meter can supply, the power switch trips to secure your installation. If your power switch regularly trips, this indicates that your installation has insufficient power for your requirements. What meter power (in kVA) for which intensity (amperes)? The more voltage and intensity, the more power your meter will require. The table below displays the power required to supply the intensity that you need. How can I increase my installation’s electrical power? increasing the meter’s power (if your electrical installation can handle this) and remaining single-phase. switching to three-phase power and potentially increasing power. For such modifications you must always contact Sibelga, the distribution system operator for natural gas and electricity in the Brussels-Capital Region. 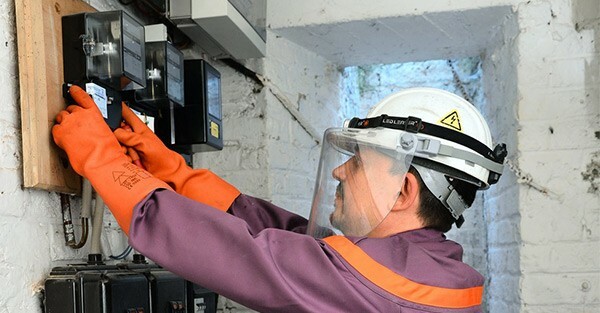 Sibelga is responsible for electricity connections, independent of the energy suppliers. Although you will be billed for the installation costs, this will not affect your monthly invoice, which will not increase.